Our group had been hunting the Superior National Forest for about two years and we hadn't been successful until this weekend. 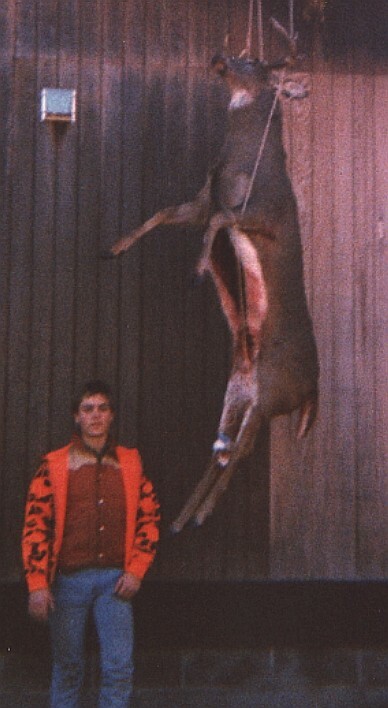 This was the first time deer hunting for my youngest brother Chris. 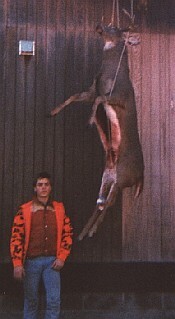 The previous morning, my brother Mike got a nice 6 point buck - his first buck ever. I was hoping to get some of that same luck. After sitting on a log for the first hour, I was thinking I needed a new spot. I followed some heavily traveled deer trails and found a nice crossing area. I put some deer scent at the crossing and climbed into a birch tree down wind. The birch tree was surrounded by small balsam trees, so I did a lot of rubbing against these pines as I made my ascent - a natural scent cover. At about 9 am this buck came running through the woods on the trail. I thought for sure it was my brother Chris since he was making so much noise. But then I saw his antlers and he stopped in his tracks when he got to the crossing. 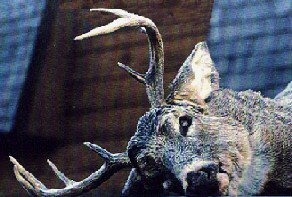 He was after that deer scent. I didn't even have my gun up yet. He looked in my direction and I froze. Then he put his head down and started coming along the trail right in front of my tree. I got my gun ready and shot him just as he passed my tree. He was only about 5 yards away so he was hard to find in the scope. He stumbled and ran for 20 yards and died. Dad showed up a few minutes later and helped with the gut. 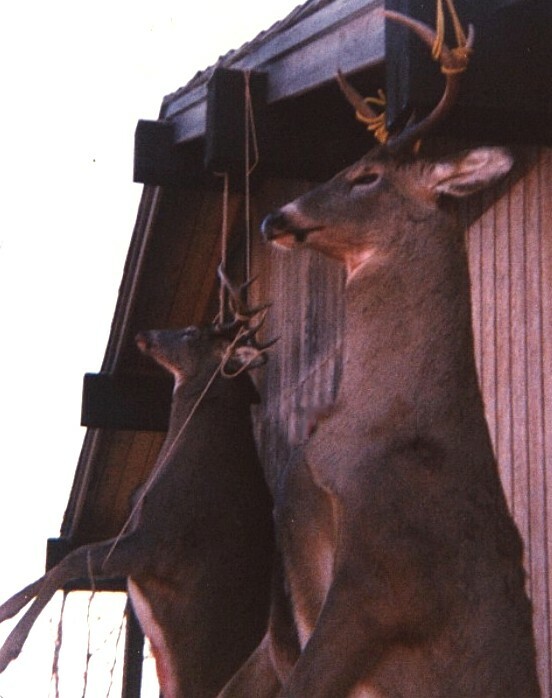 It was our second deer of the weekend after not getting any for the first couple years. Both my 8 pointer and Mike's 6 pointer were big bodied bucks - typical of northern Minnesota. We all agreed that Chris was our lucky charm since it was his first time hunting.